Looking for something specific about pond management? 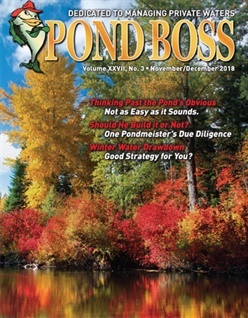 Chances are… someone has written about it in the pages of Pond Boss magazine. 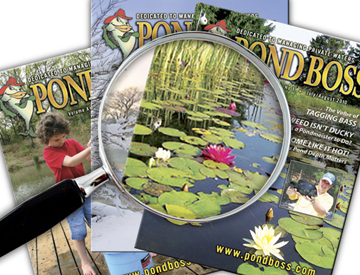 Born as a newsletter in July, 1992, Pond Boss magazine has emerged as the go-to source for all things pond. In our archives, we have a long list of back issues, loaded with practical information you can use. Want to know how to make a cane pole, fertilize a southern pond, figure out if your fish are growing or not? Maybe how to identify aquatic plants or how to build a beach? Pond Boss has it. Take a look at each year’s list of published articles and dig deeper into those things you want to know. Pond Boss back issues archives has it. More than 110 issues* of great information, at your beck and call. Note: * If the back issue you select has completely sold out, we will substitute a photocopy facsimile of the entire issue, bound and trimmed in magazine style. Should He Build It or Not?